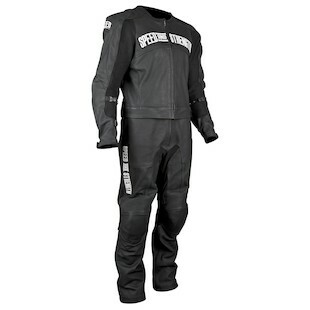 The Speed and Strength Strip Search 2-Piece Drag Suit is 1.0-1.2mm premium cowhide leather for strength and protection. CE-approved shoulder, knee and elbow armor and dual density spine protector provide additional impact protection. Features include anatomical race cut fit, high impact safety seams and Schoeller Keprotec crotch stretch panels. This is the first suit we've seen that was designed specifically for the drag strip with velcro pockets to affix your numbers. 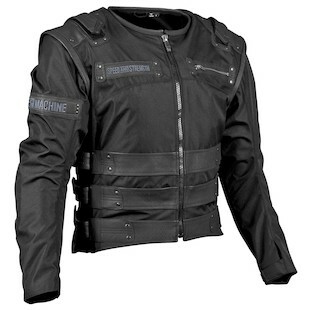 BADASS, the Speed and Strength Rage with the Machine Jacket is a water resistant AR-600 frame with leather trim, removable CE-approved shoulder and elbow protectors with a dual density spine protector. If you remove the sleeves, the jacket converts to a vest. The Speed and Strength Run With the Bulls jeans are 12oz pre-distressed denim, are reinforced in the knees and seat with Dupont Kevlar. 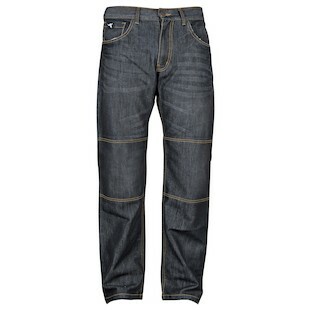 They look like your regular jeans but with a relaxed fit and boot-cut, will feel like your everyday jeans.